Over at Education NC, there’s a reporter named Alex Granados. His articles covering the NC State Board of Education have been invaluable and have included great video clips. Case in point, Granado’s picked up on the questioning of graduation rates in the state. In the first video of the article, it is pointed out there is a gap in minority proficiency rates yet these students are still being graduated. There is reference early on in the first video about the ACT. I will return to that. “The elephant in the room is are African-American getting high school degrees in which they are less prepared than their counterparts? And that is the thing this data shows and raises a serious question to me about and I’m trying to get an answer for. What Collins seems to be getting at here is the graduation rate versus the proficiency rates. In other words, how are we graduating at this rate when the proficiency rates are so low. This is something I’ve questioned this very subject before. Let’s go back to the ACT now. North Carolina made it mandatory for all 11th graders to take the ACT after the 2012 testing season. As a result, the participation rate rose enormously from 18,817 students in 2012 to 95,782 in 2013. That’s a big leap and such a leap will impact overall percentages and be a bigger picture of which students are struggling and which students are succeeding. It should be mentioned that in the three years since mandatory participation for the ACT has been imposed, not a single year has our state met the ‘college readiness’ benchmarks in any of the four subjects tested. This window coincides with the implementation of Common Core in North Carolina. How bad is that ‘college readiness’ level? 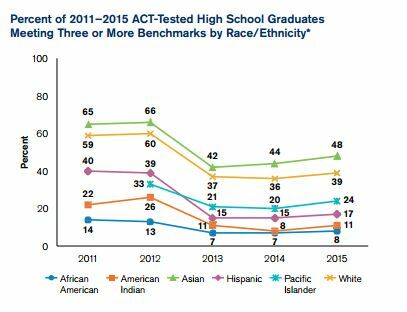 According to the 2015 ACT Readiness report, we see minorities that were scoring low to begin with, but drop off a proverbial cliff into single digits. Now, consider Superintendent Atkinson’s claims that North Carolina’s graduation rate has been steadily increasing and last year was the “highest ever” at 85.4%. How does that graduation rate reconcile with the ‘career and college readiness’ rates seen in the ACT? To put it another way, what does it say about that 85.4% graduation rate when the NC School Report card says that students were at 47.9% for “career and college ready” and a grade level proficiency at 57.9%? Putting the question bluntly, what is the true or effective graduation rate when you take into account career and college readiness? What a true reading of that 85.4% graduation rate says is that out of every 100 students, roughly 85 graduated. Of that 85 students, only 48% were considered career and college ready. That translates to 41 students out of 85 – less than half. At this rate, it will take decades for Common Core to make North Carolina’s students career and college ready. And no one has challenged Superintendent Atkinson on this until now. This entry was posted in Common Core, EDUCATION, June Atkinson, NC Board Of Education and tagged Buddy Collins, Graduation Rates, June Atkinson, NC State Board Of Education. Bookmark the permalink. Great article. It is unfortunate that Rosemary Stein did not survive the primary. We were fortunate to hear her speak at a local event last year where she presented her vision for the future of North Carolina’s children, pushing hard to eliminate the destructive Common Core that has infected our schools. Keep up the good work LL1885. Yes, Dr. Stein would have been a great advocated for our kids. Thanks for your readership and support! Back at ya. What was that line in Casablanca? “I see the beginning of a long friendship”. . . something like that. It’s good to find like minded folks in a sea of sheeple, especially those working hard to bring enlightenment and a helping hand to hopefully wake them up.